The new EcoGlow Safety 1200 Chick Brooder is ideal to raise up to 35 newly hatched chicks or ducklings and is suitable for any waterfowl or game-bird chicks and for classroom hatches. The new EcoGlow Safety Chick Brooders use a metal warming plate to even out hot and cold spots which occur with plastic heat plates and to improve heat radiation. The new flared skirt design retains more heat further reducing energy use. 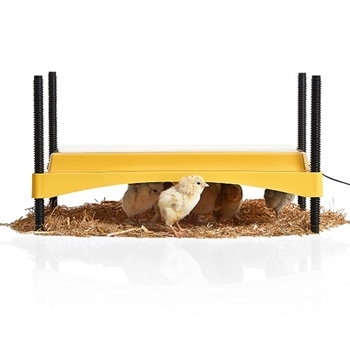 For brooding smaller or larger numbers of chicks see the Ecoglow Safety 600 or 2000.